10 years we have been supplying the best quality of Brass Fitting to large number of customers across the Nation. The products are fabricated using top quality raw components such as Brass Alloy that we buy from our most reliable sources present in the market. Our fittings are highly respected among clients owing to its dimensional stability and corrosion resistivity. These items are available in various shapes and can be made available in specified model also. Available Material : Brass, M.S. and S.S.
We are foremost manufacturer, exporter and supplier of an extensive collection of Brass Fittings. Our offered range of brass fittings is processed at our highly developed processing unit by utilizing leading technology according to the predefined standards. 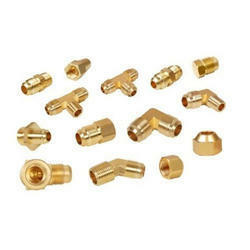 Apart from this, we examine these brass fittings on different provisions of quality. Additionally, our customers can take the whole gamut at competitive rates.